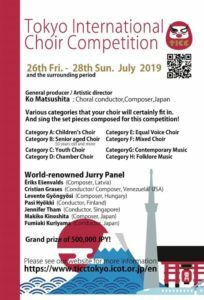 The 2nd Tokyo International Choir Competition will be held next Summer, 26th-28th July 2019 at the “Dai-ichi seimei hall (Harumi, Tokyo). Now, we are opend the application. The Deadline is the end of this month（31th December 2019）. The Dai-ichi seimei Hall, one of the best music halls in Tokyo, is located in the area where the Edo spirit still remains. At the same time, the bay area is also a place of top-running technology. Aim for the Grand prix of 500,000 JPY at this wonderful hall! And after singing…go to eat Sushi? Tempura? How about enjoying the famous Japanese noodles, Ramen or Soba? Tokyo is also a city of gourmet. You’ll definitely be captured by the appeals of this city. Fully enjoy this city packed with excite! Us, choir fans in Japan, are waiting for your arrival from the depth of our heart. 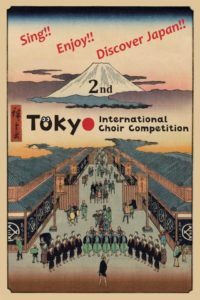 Why not create strong bonds between choirs in Tokyo? We aim to put together a fun, joyous, and “a competition that ties people together with smiles”.